Orthodox Church liturgical Bishop clergy vestments (violet-silver) by Istok Church Supplies Corp.
Liturgical Bishop Vestments signify the important standing Bishops occupy amidst Orthodox Christian clergy hierarchy and serve as a reminder of their duties as representatives of God. To invoke inspiration among the devout, they are designed to be regal and beautiful. 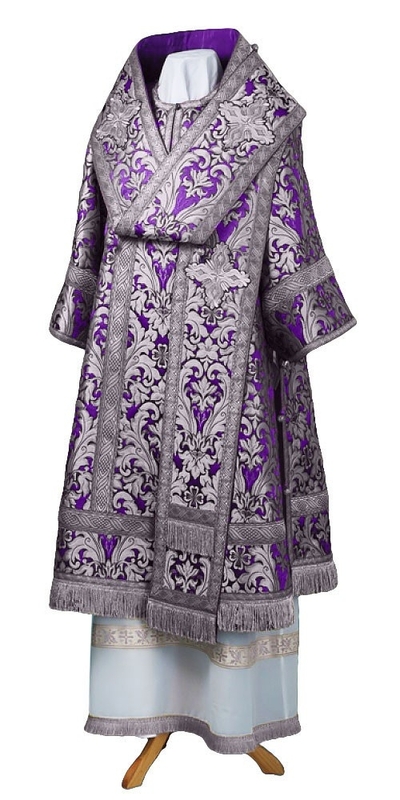 Istok Church Supplies is proud to offer magnificent Bishop Vestments in violet and silver created in accordance with established traditions and canons. While there are no hard and fast rules for the color of vestments Bishops should wear for church services, the normal practice is to do Bishop Vestments in violet and silver during the Lent period (especially weekends). We offer violet and silver Bishop Vestments in a wide range of brocade fabrics and patterns, ranging from simple to extravagant, so that customers can purchase a set that reflects their requirements and budget. We have complete sets with each set consisting of eight items - sakkos, zone, palitsa, epitralhilion, epimanika, sulok, small omophorion and large omophorion. Customers have the option of upgrading with a matching stikharion and chalice covers. Our Bishop vestments in violet and silver feature fine quality metallic or rayon jacquard brocade and prices depend on the class of brocade chosen. Customers who would like to order a particular design in a different fabric belonging to the same class can make a mention of their preferred fabric in the Notes section of their order. We offer these vestments in three different styles – standard, premier and luxury. Our standard type Bishop vestments are simple and affordable – they feature inexpensive trimmings and machine embroidered crosses. The premier type vestments incorporate high quality galloon and intricately embroidered crosses. For luxury type vestments, we provide solid jacquard galloon and rich hand embroidered crosses. Customers can further customize their vestment by ordering a hand embroidered icon for the back. We request you to send in your measurements as per our measurement chart as soon as possible so that our dedicated master tailors in Europe can begin working on your custom order.